Dalmatians are a fun loving, happy breed. They are charming, loyal, funny and definitely earn their clown status daily. like strangers you should socialize them well as small puppies. activity level, which varies depending on each specific animals individual personality. They need regular walks as puppies but as they age they typically adjust to the life style of their family. ​Dalmatian you should plan to include them in your family life. If you do they will be eager to please you. 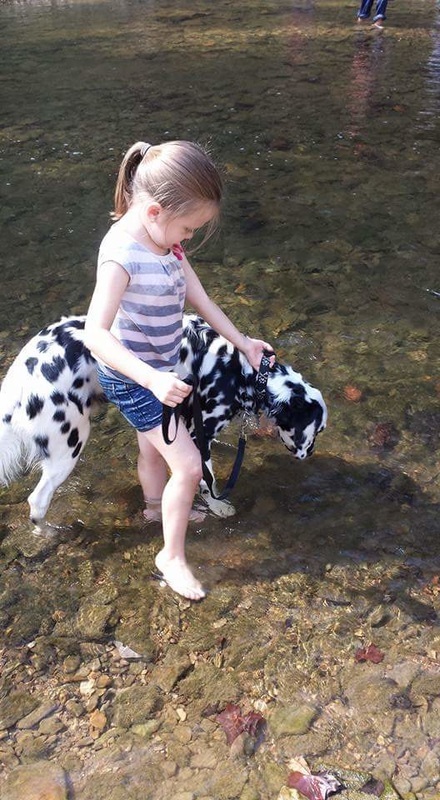 Are Dalmatians Good With Children? Our dogs are fabulous with our 7 children. They are loving, gentle, protective and loyal to our entire family. Children should be taught to respect animals and dogs in turn should know their place in the family. Dogs must be taught to respect and be tolerant of children. This is best started at birth. Which is what we do here with our puppies. If you have never done any basic dog obedience training, a class would be a good idea. That is not just for Dalmatians but for any new puppy. Both the dog and everyone who spends time around your dog will benefit greatly. A well trained dog makes a happy family and a happy pet! The long coat Dalmatian hair is soft and silky. It is easy to sweep up and does not stick to things. They should be brushed out about once every other week. Their fur only typically grows to about 2-4 inches on their body. They produce beautiful "feathering" on their tails, ears and legs. The feathering will grow out several inches as they age. They also shed all year around. diet and regular grooming will greatly reduce shedding. Dalmatians are a relatively healthy breed. The biggest Dalmatian health concern is bladder stones. This is caused by High Uric Acid levels, an inability to process purines. 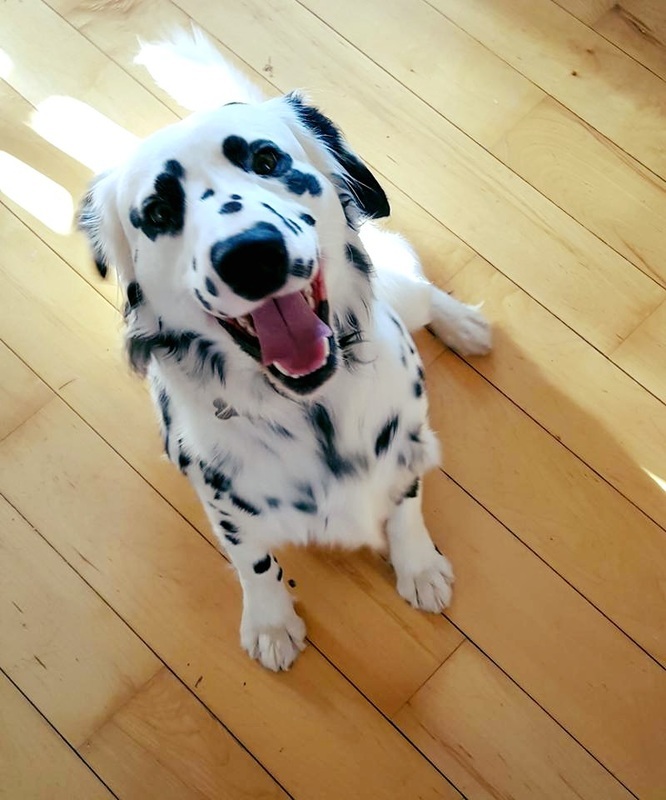 All Dalmatians naturally carry this gene but it has been selectively bred out the LUA backcross project. My dogs here and past puppies do not have a history of stone forming. However, it is always a possibility since all Dalmatians naturally carry the gene that causes the high uric acid levels. That is why I offer a health guaruntee. That is why I have decided to breed the LUA gene into our lines. To provide the healthiest puppies possible to our families. No special diet is recommended or required unless the dog begins having frequent urinary tract infections. The most important part of avoiding stones is hydration. Lots of fresh water should always be available. "Wetting" food as well as frequent bathroom breaks to flush their system. I am very excited to announce the addition of Solomon! 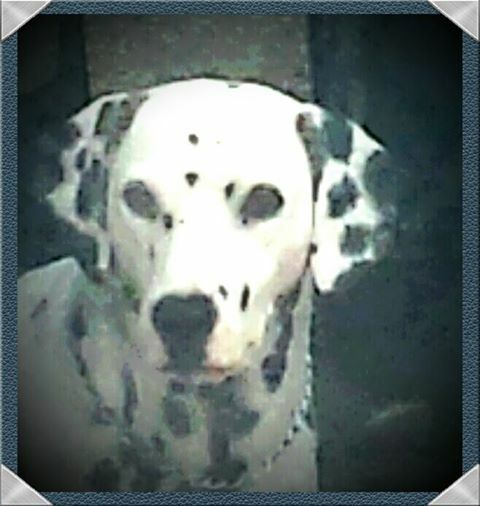 Sol is a homozygous LUA male Dalmatian and our newest stud dog. Homozygous is a really big deal because that means Solomon carries 2 copies of the gene for normal uric acid levels! Basically the way genetics break down is that because Sol carries 2 genes every single puppy he produces will carry a copy and have normal genetics. That means none of his puppies will be at risk for stone forming. I'm excited for the breed as a whole and for our breeding program here. Solomon is also a long coat gene carrier. Which means happier, healthier long coat puppies will be entering the world. Read more about the Dalmatian heritage project, LUA Dalmatians and Dr Schaible. The man who had a dream, his dream became a mission and now his mission will save thousands of Dalmatians all over the world. Every Dalmatian lover in the world should be cheering his name! Dalmatians can be born deaf. The hearing loss is linked to the pigment of the inner ear and any animals that are white are at risk. They do not go deaf after birth unless there is injury, illness or possibly as a side effect from old age. All of my dogs have been BAER hearing tested prior to breeding. I only breed dogs that have perfect BAER bilateral(Both ears)hearing. Puppies are BAER hearing tested with a Veternary Neurologist to confirm hearing. I will likely know if a puppy is deaf in both ears but the only way to guarantee they can actually hear in BOTH ears or only 1 ear is by doing the BAER hearing exam with the specialist. Copies of your puppies test results will be included in their new puppy packet. What do I do with my deaf puppies? Fortunately I have had fabulous hearing results and only ever produced 2 bilaterally deaf puppies! Deaf puppies are still perfectly healthy animals that can have long happy lives. ​ I accept applications and will keep a waiting list for deaf puppies. They are placed at a reduced fee of $200.00 to an appropriate home that can meet their needs. They will not go into rescues and will always remain in my home with my family until the perfect home is found. Just like all the rest of my puppies do. Below I have listed some answers to common questions I am asked. I love talking about my dogs and if given the chance I could just talk about them all day long. However, I often have very full days. If I am unavailable for questions I hope this page will help interested owners. Will all of the puppies be long coat? No, the gene is recessive so two carriers must be bred together bin order to produce the long coat puppies. Puppies produced in litters will be long coat and standard coat puppies. Depending on the breeding combination a litter may be entirely long coat, entirely standard coat. Since Solomon is a gene carrier, any litter produced by him and a long coat female will be a combination of both long coat and standard coat puppies. Both liver and black spotted puppies may be produced. Each puppy will be listed with specifics about their genetic make up. Will a standard coat puppy grow long hair? No, a standard coat puppy will always have a standard coat. If the puppy has a long coat parent they will carry the recessive gene. Just like a black spotted Dalmatian spots will not turn liver, a standard coat will not "turn" into a long coat. ​What's up with the bunny? If you have noticed a bunny in a few pictures, his name is Thumper. Aside from being adorable, Thumper also has an important job here for our family and the puppies. Thumper helps me test temperament and prey drive. The puppies first introduction to Thumper is going to be during their evaluation. After that puppies will continue to be socialized with him. Any puppies that initially score poorly will be frequently reintroduced to Thumper to learn appropriate behavior towards small animals. What is a deposit and why should you place one? ​*A deposit is accepted to hold a puppy until they are ready to go home. *Why do breeders wait until after 6 weeks to help families choose their puppy? 1. Dalmatian puppies are born white. The spotting patterns they develop are as unique as our finger prints. As a breeder I have an idea of the spotting patterns at a few days old but ultimately even I have no idea exactly what each puppy will look like until about 4 weeks. 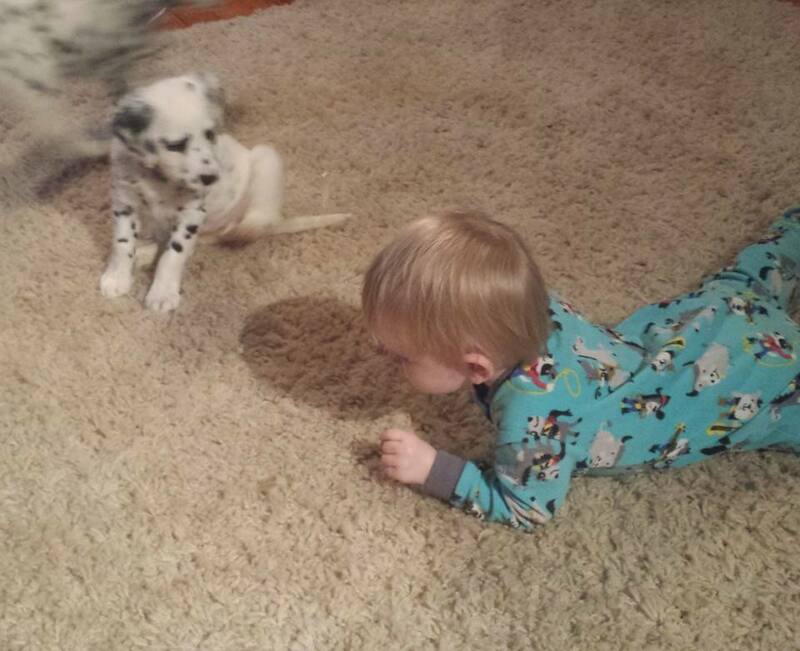 Most people purchasing a Dalmatian puppy have spotting pattern preferences. 2. Health- You want to wait until after BAER hearing exams and get checks are complete to choose a puppy. Dalmatians can be born deaf. It would be heartbreaking to choose a family pet only to have it fail its BAER exam or find out the puppy you had you heart set on showing wasn't a good candidate. Some families could adapt but others may not be able to appropriately meet the needs of a special needs puppy. It's best to just wait. 3. Temperament- Lastly but most importantly temperament is not established until several weeks old. Temperament is still quite easily shaped at young ages but certain puppies may naturally fit in to certain life styles better. It's my goal to not just give you a gorgeous family pet but a family member that will fit into your life with ease. That's why I Volhard aptitude test my puppies. The test shouldn't be performed at a very young age as results are most consistent around the 5-6 week mark. Again it's best to wait and get the perfect puppy. Puppies are chosen in the order Deposits are accepted. The sooner you put a deposit down, the more options there are for puppies. ​. Example: The litter is born with 4 females and 8 males. 1st deposit for a male puppy will be able to choose from all 8 male puppies, 2nd deposit will choose from the remaining 7 males and 3rd deposit will have to choose from the remaining 6 male puppies etc. After all appropriate tests are done I go down the list and schedule appointments with each family to come choose their puppy. If you are unable to come select your puppy in person then alternate arrangements are made. We will discuss test results and then use FaceTime or Skype to select your perfect puppy. So you still get to meet us and the puppies "in person". If after choices are made and health tests are complete you are not satisfied with the remaining puppies I will transfer you over to 1st or 2nd choice of my next litter. Depending on availability. 5. At what age do puppies go home? Puppies can leave as early as 8 weeks of age. I like to see puppies placed in their forever homes by about 12 weeks of age. 6. I do not currently ship puppies by air or any other means. I can meet at some locations or deliver to some locations depending on our current schedule. *There is a $5.00 per $100.00 sent service charge if you decide to use PayPal. *When mailing in your deposit, it must be mailed via certified mail, with a tracking number. That is for both your protection and mine. A copy of your application should also be included with your mailed deposit. *Deposits are always transferable, no questions asked. If you place a deposit and circumstancess suddenly change, that's OK. I only want my puppies going to homes under good circumstances. Please contact me immediately. I will glady transfer your deposit to a later litter. *The deposit amount is $200.00. ​If you have any more questions, please do not hesitate to email, call or text me. I look forward to meeting you! If you are having a difficult time reaching me please be patient. I have a large family (both fur and people) and I can get very busy. The absolute best way to make certain you get through to me, is by sending a mesage to my email listed below with your contact information. I will return your call at my soonest availability. Are you a Dalmatian person?